We just launched the STS-118 Space Shuttle this past week and we all have smiles on our faces. It’s good to be sending a shuttle to the Space Station again. First from Bill Haugen. "Sue & I had a fun visit to watch graduate/swear in a young man I met 10 years ago in PA and encouraged toward USAFA: 2/LT Ian Whiteman. It’s always impressive and moving as Thunderbirds roar over and hats fly. We stayed with Nan & Kinney Smith in Woodland Park. 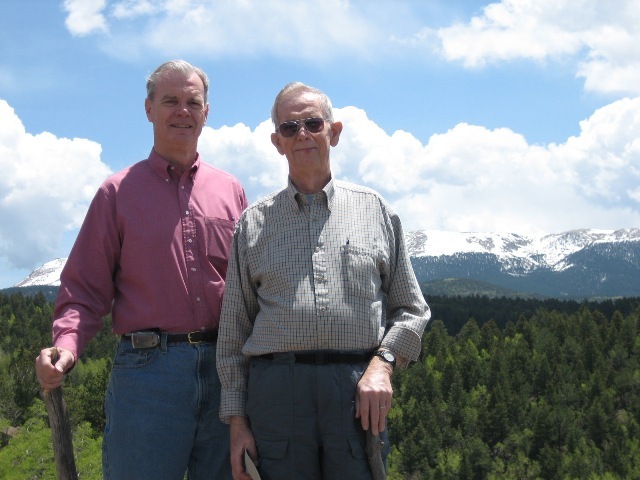 The attached picture shows Kin and I with Pikes Peak behind us. We also visited Bo & Nancy Ohman but no photo. From Gail Peck . "Last Monday evening Rick Perlotto and his friend, Kathleen, joined Mike and Kay Butchko, Hesh and Bobbi Altman and Gail and Carol Peck here in Vegas. A good time was had by all, in spite of the lies and exaggerations. Rick and Kathleen attended his daughter, Carla's, graduation. That is Dr Carla now! Mucho congratulations to her!" I also got this from Gail. "Had a great conversation with classmate and my former roommate, Warren Robbins. He continues to make progress after suffering a stroke a while back. He is now able to take short walks without his cane or walker and seems to be making progress everyday. He sounded like the Robbie of old on the phone. I am including his phone number in case any of you want to call him and chat. I know he would appreciate the contact. He treasures our class at the AFA and all of you. Call Robbie at 253 838-3624 and say hi and if you are in the Seattle area or later this summer in Phoenix plan to stop and say hi. Congrats on our 49th anniversary on our trip to Denver and the start of a long journey together. As always, Gail Peck, 1225K"
This organization's goal is to provide college scholarships to children of military personnel who were killed in action. Bring Me Men, Roger Rhoades." It’s especially sad since Roger and Judi were mentioned in the previous Grads column when they were visited by the Landers. And this from Harry Paddon. "This is the year of reunions for me. In May, I went to my F-105 squadron reunion in San Antonio. The 34th TFS was stationed at Korat in Thailand. We had about 120 complete 100 missions over North Vietnam and 60 were at the reunion. My wife, Pat, and I went to my 50th high school reunion in Maryland in June. The class had 600 graduates and 160 were at the reunion. I was surprised to discover that there were 3 other retired AF officers in the class and 2 other classmates were KIA in Vietnam in F-4s. Pat and I will be attending my son-in-law's retirement from the USAF in August. He is at ACC at Langley and is a B-1 WSO. Now that really makes me feel my age. See you in October in Colorado." A short note from Alex Harwick . "At the moment I am in Turkey regarding business. Prior to that I was on a mission trip to Ukraine. All's well. Again thanks. Looking forward to seeing you again soon. Alex"
Got a missive from Chuck Cheeseman. "Chuck Cheeseman's 17-year-old daughter, Emily, and her Russian friend, Alona, spent two weeks in St. Petersburg in June. The ladies attempted to connect with classmate George Thompson, who teaches in nearby Pskov, but, unfortunately, the best that could be arranged was a phone call between Alona and George. As a side note, Emily was at the 1992 30th RTB reunion as a two-year old, making Cheezie the (then) father of the youngest RTB kid! Chuck" Thanks, Chuck. And now some words from the Patries. "Dear Jack, Congratulations on your weight loss! I KNOW how difficult that can be believe me! Stan registered us for the reunion the other day; Yes, the mountains are treating us well. We're thankfully at least 10 degrees cooler day and night than the "flatlands". Stan keeps busy with gardening. He hikes with 2 groups. There are about 350 waterfalls in our area so hiking is a treat. We have taken Ballroom Dancing classes for a couple of years. Foremost, Stan is caretaker for his 92 year old mother. She lives about 4 miles from us and is an incredible person. Up to now she has lived in her own place, quilts, gardens, does her own cleaning, knows how to use a computer. I taught her how to make greeting cards. She also had her Driver's License renewed for 5 years on her 90th birthday! Last June she broke her left hip but recovered wonderfully. This June she broke her right hip and it's been more difficult for her. She's been staying at our house to complete her recuperation but is looking forward to moving back to her place this next week. We have our fingers crossed that it will go well for her. See you in October. Mary Anne & Stan." From Tom Rausch: For the 45th reunion, I am offering commemorative coins the same as the 40th ones except with the new date & Red Tag 45th Reunion and with the Academy crest on one side & the ‘62 crest on the other. Available in gold, silver, bronze, and pewter in a plastic case. The cut off date for delivery at the re-union has passed. But some extras may be available, depending on how many we order; but figure $4 each for planning purposes." Thanks Tom. And this one from ThaRipper about the reunion. "Red Tags - It's time to register for the 45th reunion (31 Oct - 4 Nov.) Go to www.usafa.org - You do not have to be an AOG Member. -Update your profile (left side of home page -if you haven't gotten previous mailouts, your address may be wrong). - Here you will find links to register for the reunion, the hotel, football game tickets, purchasing reunion merchandise, schedules, activities, etc. RTB 45 Reunion Committee Chairman, (719)686-1408 or tharipper@msn.com. Even if you can't go to our 45th Reunion, PLEASE come to this party. We had a great party 5 years ago and expect even better this time. 10% of our class is in the Washington DC area - should be a good turnout. Redtags from other areas come join us! [ e-mail, phone number, & mail address ]. Details to follow. Send info ASAP to: wjens77@verizon.net [preferably], or call 703-536-1011.